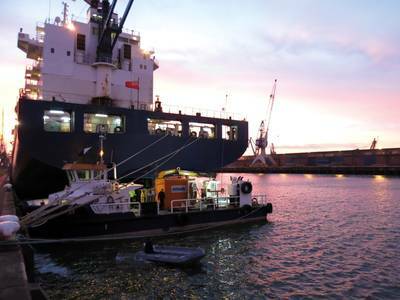 In the beginning of December a Hydrex diving team mobilized to a 170-meter container vessel with one of our workboats. The team installed a doubler plate over the cavitated area of the rudder during the ship’s scheduled maintenance stop in Rotterdam. An earlier inspection carried out in Algeciras had revealed the damage to the rudder. A condition of class was imposed on the vessel and a custom solution was needed. We proposed a repair plan to the class that would allow the vessel to keep sailing until the next scheduled docking. Deployment to the vessel was done using a Hydrex workboat loaded with all the needed equipment. The catamarans are fully equipped as dive support stations with hydraulic cranes, winches and a dive control room. They can be used for a wide range of operations in Belgium, the Netherlands and France. This increases flexibility of operations. After our team arrived on-site with the workboat, they performed an underwater inspection of the leading edge of the rudder, where the damage was situated. The divers then started preparing the affected area for the installation of the doubler plate. The plate had been prepared in advance. This was done with the information of the preliminary inspection in Algeciras combined with the drawings of the rudder, provided by the owner. When the rudder had been prepared our certified diver/welders fitted the plate and secured it. The team then installed anodes on both sides of the rudder for further protection. This concluded the repair. A dive support workboat allowed for fast mobilization to the ship’s location in Rotterdam. The diver/technician team worked in shifts and finished the operation in 24 hours within the schedule of the container vessel. During the operation a representative of the classification society was present. He gave his approval for the repair. The owner can now sail his ship until the next scheduled drydocking without having to worry about further unscheduled delays or repairs to its rudder.